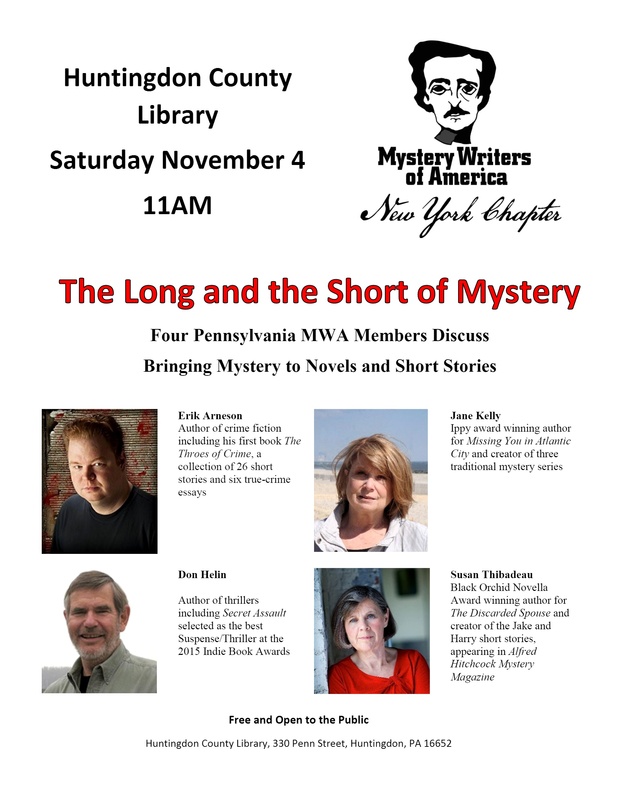 Four mystery authors will be at the Huntingdon County Library in Huntingdon, PA, this Saturday (Nov. 4, 2017) at 11 a.m. Please join us if you can! The lineup includes Jane Kelly, Don Helin, Susan Thibadeau, and me. We’ll be talking about “The Long and the Short of Mystery” — discussing what goes into writing both novels and short stories. The library is located at 330 Penn St., Huntingdon, PA. The event, organized by Mystery Writers of America, is free and open to the public. I hope to see you there! All the events are free, feature great authors reading great stories, and there’s a good chance you might win a book. 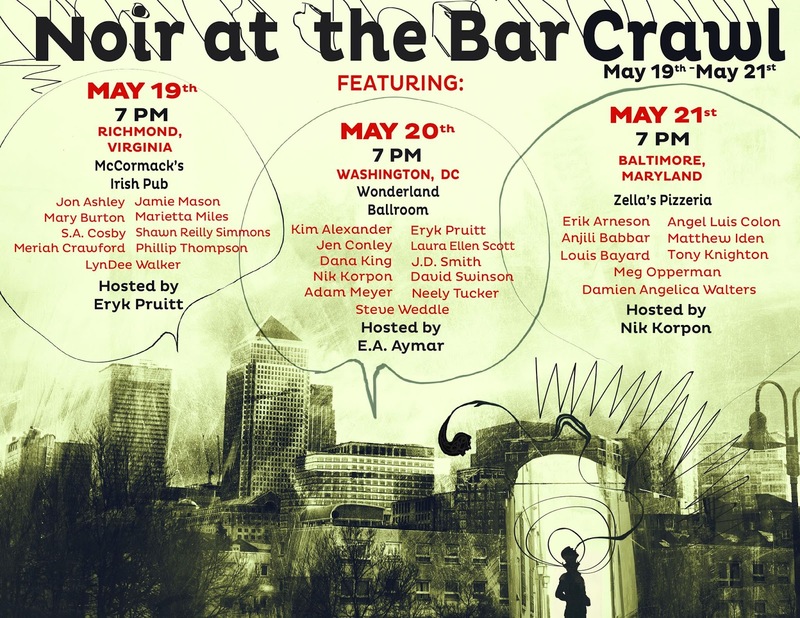 Noir at the Bar is always a great time, and I’ll be reading a story on Sunday, May 21, in Baltimore. Hope to see you there! On Saturday, I had a great time talking about mysteries and crime fiction with a great group of Pennsylvania authors at Muhlenberg Community Library in Berks County. 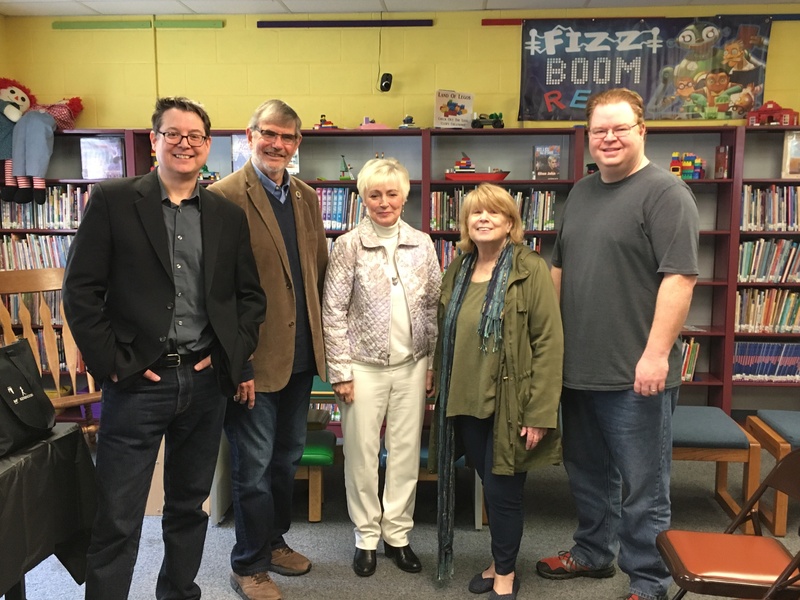 Many thanks to the library for hosting (left to right in the photo) Jon McGoran, Don Helin, Nancy A. Hughes, organizer Jane Kelly, and me. We had a lot of fun! Since 1984, Bob McGinn has covered the Green Bay Packers. First for the Green Bay Press-Gazette, then for the Milwaukee Journal-Sentinel. I’ve been reading Bob’s work regularly since the Internet first gave me access to the Journal-Sentinel. His articles and columns are among the very best sportswriting you’ll ever read. Heck, they’re among the very best writing, period. His day-after-the-game stories are always the best, his in-depth game analyses later in the week are uniformly outstanding, and his NFL draft coverage is without equal. Yesterday, the Journal-Sentinel announced that Bob’s retiring. It hit me like a ton of bricks. Although we’ve never met, Bob’s like a member of the family. Dad and I had too many conversations to remember which began with something Bob wrote about the Packers. He was diligent, fair, tough, and knowledgeable. He was exactly what you want in a sportswriter. In January, Sports Illustrated featured an in-depth profile of Bob, written by Greg Bishop. Reading that piece is a great way to understand why Bob was so revered by fans, players, and writers alike. To Bob and his wife Ann, I offer my best wishes. Thank you for all of your work covering the Green Bay Packers, and thank you for your dedication to a job well done. Season 4 of the Title 18: Word Crimes podcast is underway! We’re three episodes in, and all three have featured an outstanding new reader, Mary Wilson, a reporter and producer at Slate’s The Gist. So far, Mary has read “Thoroughly Murdered Millie” by April Kelly, “Knockout” by Eryk Pruitt, and “A Nice Pair of Guns” by Nick Kolakowski. Check out the Title 18: Word Crimes podcast at WordCrimesPodcast.com, on iTunes, on Stitcher, or wherever you listen to podcasts. So I’m particularly excited to be interviewed in the LDN about my crime writing. I talked to Les Stewart — a reporter straight out of Central Casting, and a reporter who taught me a lot during my time there — about my short story collection THE THROES OF CRIME, the Lebanon County roots of the story “The Murder of Ernest Trapnell,” playing board games, and much more.